American author of Gone with the Wind. Typewritten Letter Signed, one page, quarto, Atlanta, Georgia, January 7, 1936. On her name-imprinted stationery, to Dr. Mayos. “Thank you so much for your New Year’s note and all your good wishes. I had it on my mind to send you a Christmas card, but everything piled up on me so heavily in the holidays that I had to run away from town without sending any cards. Thank you so much for your thought of me. I have frequently thought that the last six months and their happenings might be of some interest to a psychiatrist-not, I hasten to add, with me as the patient!-but from the viewpoint of public reaction through letters and ‘phone calls and personal calls. I have been in a rare position of seeing many thousand different kinds of people and judging public reactions. “May I tell you one thing which I think will interest you? So far, out of thousands of letters, I have received only one which was apparently written by an unbalanced person. From my experience as a newspaper reporter I knew that people who were luckless enough to get themselves on the front pages were the target of letters from cranks and the somewhat insane. I fully expected that half my mail would be of this type because I have seen it happen dozens of times, but I was very happily disappointed. “I’d like to take this opportunity to thank you again for the little book of poems you sent me. I and my friends have found them most interesting, and, as you can imagine, most heartbreaking. And best wishes for the New Year. This June marks the 81st anniversary of the publication of Gone With the Wind, a sole novel by a Southern writer which took ten years to write and swept the country by storm. The book was composed out of order; Margaret Mitchell started with the last chapter first. She named her heroine Pansy, only changing her name to Scarlett at the last minute (then had to pay fifty-cents an hour to have every page mentioning Pansy retyped). Few people knew what Margaret Mitchell was doing. A reporter, she wrote on blank newsprint, putting finished chapters in individual manila envelopes, sometimes with grocery lists scrawled on them, and stored in a closet. 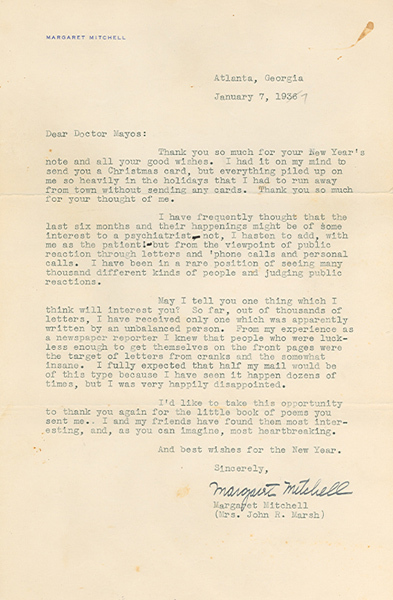 In April 1935, the editor in chief of Macmillan, while on a scouting trip to Atlanta, somehow learned of the novel which was never-endingly-in-progress, pried the manila envelopes loose from Margaret Mitchell and sent them to New York for evaluation. The reaction was enthusiastic; Macmillan wanted to publish the following spring. From August 1935 to January 1936, Mitchell, with the help of her husband, John Marsh, and a small army of typists and stenographers, essentially rewrote and retyped the entire book, cutting refining, straightening out inconsistencies and fixing historical inaccuracies. Gone With the Wind was published in May 1936; it won the Pulitzer Prize in 1937.